The dragonfly is one of natures most impressive flyers. Some can fly at speeds up to 35 mph, can decelerate from 35-0 mph in less than a second, and fly backwards. They are extremely agile and can make dramatic lateral movements in the blink of an eye. These amazing abilities come from dragonflies unique flying style. First dragonfly use aerodynamic drag instead of aerodynamic lift to propel themselves through the air. They flap their wings up and down perpendicularly to the direction of flight. 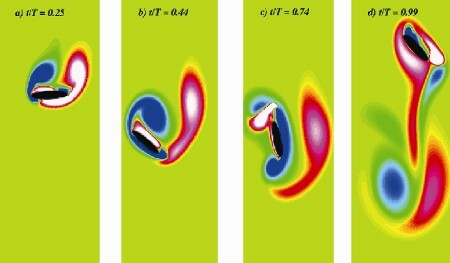 Computational simulation of dragonfly wings during hovering, by Z. Jane Wang. The left vortex rotates clockwise and the right vortex rotates counter-clockwise. The angle to which the wings are twisted (angle of attack) affects many aspects of the flight, most notably the flight speed. As the angle of attack of the wing increases, the flight speed of the fly increases. Another unique attribute of dragonfly flight is that they have two sets of wings each separately controlled. This attribute is what makes them exceptionally agile. They vary the phase difference between the forewing and the hindwing to perform different aspects of flight. A phase difference between 55-100 degrees (angle one would see between the forewing and hindwing if the dragonfly was flying straight at you) is commonly used for straight forward flight. A 180 degree phase difference is used for hovering and 0 degree phase difference (both wings flapping together) is used for accelerating or maneuvering. These two very unique features make the dragonfly one of natures most proficient flyers. If engineers could apply this idea to a flapping aircraft, it would be an enormous breakthrough and a huge step towards more agile aircraft. Dragonflies inspire wing design in flying robots, Steve Bush for Electronics Weekly. The dragonfly is certainly the most amazing flier, because of its four wings.